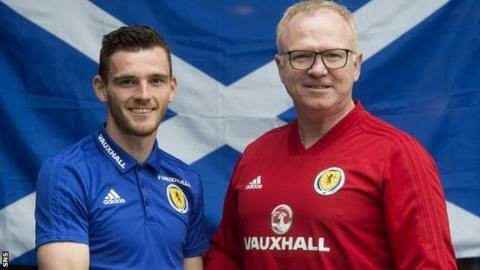 Former Scotland striker Ally McCoist thinks Andy Robertson will join Billy Bremner and Kenny Dalglish among the great national captains. The Liverpool left-back has been chosen as the successor to Scott Brown, who has retired from international football, by manager Alex McLeish. "He's a guy who always leads by example and, if you look at Scotland captains of the past, every one of them led by example, going back to Billy Bremner and all these guys," McCoist said of the 22-times capped 24-year-old. "Wee Robertson will do just that. I speak to a lot of the Liverpool boys and they say he trains as he plays, which is a great example. "It's been a wee while since we had a really top, iconic Scottish player that we can all relate to and hold in great esteem. "I am putting pressure on him here, but I just hope that, with continued success, we can be talking about him in the same way we do with a Kenny Dalglish or a Gordon McQueen - great Scotland players - and I'd be surprised if that wasn't the case." Robertson, who started his senior career with amateurs Queen's Park, has established himself as first choice at Liverpool after moving from Hull City last year. "When you think, four or five years ago, Robertson was playing for Queen's Park, it's been a brilliant journey," McCoist said. "He's a wonderful choice as captain and what an example for younger kids to look at. There you go, from Queen's Park to the Champions League final and now captaining your country. A brilliant story." McCoist believes McLeish has a more difficult decision to make when choosing a goalkeeper for the friendly against Belgium and Nations League opener with Albania. Craig Gordon was first choice for the World Cup qualifying campaign, but Allan McGregor, who returned to Rangers from Hull this summer, impressed in Sunday's 1-0 defeat by his rival's Celtic side. "It's a tight battle," McCoist said. "The funny thing is Celtic probably did not do Craig Gordon any favours because he was very, very quiet. "If you're looking at that Old Firm game in isolation then McGregor is the one you're talking about because he's made a string of top saves. "But, to be fair, we are in a fortunate position with the two keepers."